How did a since-deleted viral tweet involve two Valley elected leaders? The head of a New York City-based philanthropic foundation tweeted a video of President Donald Trump talking about immigrants. “. @realDonaldTrump on people asking for asylum “These aren’t people. These are animals,” Mark Elliott, the president of Economic Mobility Corporation, wrote. The tweet, which was accompanied by a 47-second video of Trump, had 15,000 retweets by Monday morning after its Friday afternoon posting. 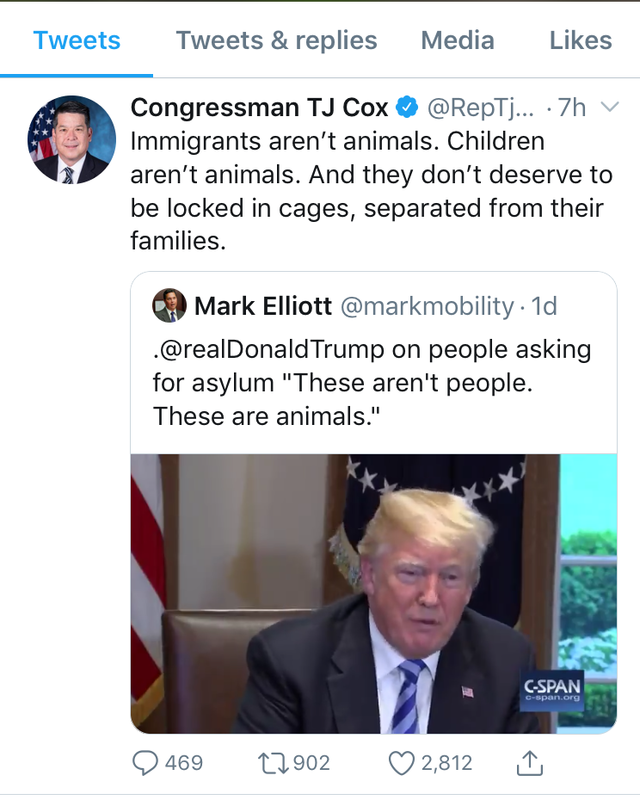 Among the retweeters: Rep. TJ Cox (D-Fresno). The video was from a May 16, 2018, White House roundtable on immigration. Among the president’s guests was Fresno County Sheriff Margaret Mims. Many pointed out that Elliott’s tweet took Trump’s comments out of context. Trump’s comments came in response to a point raised by Mims about the MS-13 gang. “There could be an MS-13 member I know about — if they don’t reach a certain threshold, I cannot tell ICE about it,” she said to the president. That’s when Trump responded, in the video still housed on C-SPAN, calling MS-13 “animals.” Watch the video below at the 24:31 mark. Elliott admitted that his tweet took the comment out of context. He deleted the tweet Monday morning at 9:31 a.m.
“I have learned that Trump’s comments were in response to a specific question about MS-13 members and not about asylum seekers more broadly. I have chosen to delete the tweet, but am copying it here. My apologies for not being more accurate,” Elliott wrote. “Immigrants aren’t animals. Children aren’t animals. And they don’t deserve to be locked in cages, separated from their families,” Cox replied Saturday to Elliott on Twitter. Also on Monday, Cox (or someone in his office) commented on the resignation of Homeland Security Secretary Kirstjen Nielsen via Twitter. “Let’s be clear: This President’s hatred of immigrants is greater than any one member of his Cabinet. He announced his run for President by calling Mexican immigrants rapists & criminals, claimed that an American-born judge couldn’t fairly decide a case because of the color of his skin, and has questioned why the United States would open our arms to anyone from “s***hole countries.” Cox wrote in part across six separate tweets. Mims said that she wanted to speak with Cox before judging him on his retweet. “At this point, I’m going to give the congressman the benefit of the doubt until I talk to him about it. I will talk to him” she said. Mims also criticized Elliott’s original tweet. “Posting the video as it had been posted is untruthful because it doesn’t show the whole context of the conversation. Whenever somebody does that, everything else they say is suspect,” Mims said. Mims met with Trump along the border in Calexico last Friday (April 5). “My purpose for being there was to discuss the impact on local communities. When things aren’t secure at our borders, we feel that up in our area,” she said. She referred to drug interdiction, especially fentanyl. “It is not a one-thing-fix-all when it comes to the border. We need border security, as well as comprehensive immigration reform,” she said. Since her conversation with the president last May, Mims says things have improved regarding MS-13 in Fresno County. “Once we started this and got the message that we are serious with federal prosecution, our violence out there related to MS-13 has greatly diminished,” she said. This story has been updated with a comment from Cox’s office.